It's World Autism Acceptance Day! Which I'm going to take on in two parts. First, let's talk about apps for autistic kids, because Parenting.com just asked me for my recommendations for apps for kids like Leo in general*, Tech In Special Ed just published a guest post by me on apps for older kids, and iAutism has put together a list of nearly 200 Free or discounted apps for World Autism Awareness Day (2013). Here are my current thoughts on apps that work for Leo and his sisters, on "go-to" apps for autistic kids, and some qualifications on what makes a good app for autistic kids in general. My kids really like the new app Kid in Story ($6.99) -- it's a story making app that lets you take pictures of your kids and "greenscreen" them right into a storybook with custom voiceover and whatever backgrounds you choose -- your own photos, included story templates, etc. 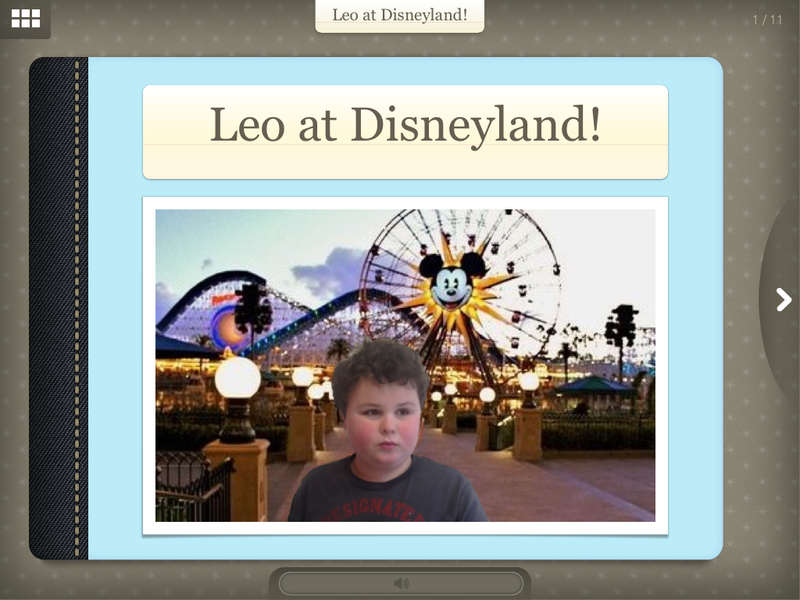 We've used Kid in Story to help my twelve-year-old autistic son Leo get ready for trips and transitions, and to create memory books of favorite activities like trips to Disneyland. His eight-year-old little sister Mali tends to use Kid in Story to put herself in imaginary Minecraft or Lord of the Rings adventures. Kid in Story also has a free Reader companion app, so we can share the stories with grandparents, cousins, and Leo's therapy team and teacher. We also love Netflix (Free). The app includes a Just for Kids section, and Leo loves browsing it -- he discovers shows like the new CG animated Thomas the Train series and uncovers old favorites like Dragon Tales. And because the Netflix app includes the graphic logos for each show, my son (who still struggles with reading) can use it independently -- he can watch what he wants to watch when he wants to watch it, and doesn't have to wait for us to queue up the shows he wants on DVD or TiVo. Most apps by TocaBoca, Duck Duck Moose, Spinlight Studios, and Oceanhouse Media are consistently hits with my kids, because they are not just fun but beautifully and intuitively designed -- my kids can jump right into all their apps and start playing (from their perspective) and learning (from mine). Anything with an intuitive visual interface, especially those that don't require reading since Leo's not reading fluently yet. He currently loves the sewer alligator game Where's My Water (free), the musical free play app TocaBand ($2.99), and all of Oceanhouse Media's interactive Dr. Seuss books because they include touch-each-word voiceover and so let him "read" his favorite books independently. And lately, he's been going back to the paper Seuss books and "reading" them out loud thanks to his constant iPad practicing! There are no "go-to" apps for autistic kids, not really, because the abilities of autistic kids vary so widely -- some are hyperlexic and teach themselves to read at age two, others still struggle with reading as they enter their teens. Some autistic kids are very visually oriented, like my son Leo, others just want deep information on their areas of special interest. It really depends on what your child wants and needs. That's why my SLP and Autistic collaborators put together our app spreadsheet (http://www.squidalicious.com/2011/01/ipad-apps-for-autism-spreadsheet-of.html), to help guide autistic kids, their parents, autism professionals, and adult Autistics to a selection of apps that we think are valuable and worth their time. And we appreciate feedback! Good design, then good content. Good design is what lets Leo use apps independently or with minimal support, and then access the content. So many app developers have good intentions and sometimes even great ideas, but don't understand graphic or interface design. And I'm not saying my son doesn't still play with and enjoy some of those apps. But bad design makes it impossible for Leo to use some of the apps that could benefit him most. Again, this is why we screen and select apps for our recommended autism apps spreadsheet. I recommend looking at the iTunes reviews as well. iTunes no longer lets people who have received developer promo codes leave reviews, so you don't have to worry so much about skewed positive ratings. *One blip -- the Parenting.com article has me recommending an app called Look in My Eyes, based on a 2010 article of mine called Leo's iPad Apps for Kids With Autism Starter Kit. I no longer recommend Look in my Eyes -- and it has been taken off our spreadsheet for recommended apps -- because autistic people often find eye contact painful, and unnecessary, and often say "I can look at you, or I can talk to you, but not both." I have since updated the post with the de-recommendation. It’s a really good and informative blog for autistic kids; Thanks for sharing to all.